I converted the Reveal.js slides checkout to use the Angular 2 CLI. That let me include two small Angular 2 components within the slides themselves. Which also allowed me to demonstrate using the pan gesture without leaving the presentation. The Angular CLI also made it easy to generate and publish the presentation to the GitHub pages associated with the slides via ng github-pages:deploy. Here's the source code for the slides/components. 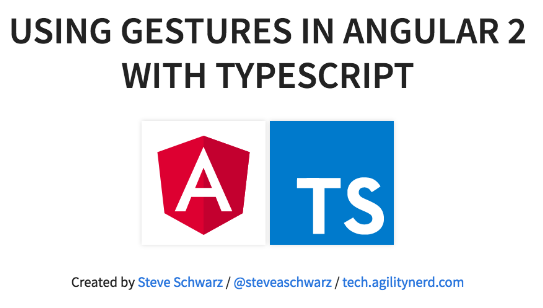 I have more examples of using gestures in the larger demo app I showed at the beginning of the talk: Angular 2 TypeScript Virtual Image Cropping repository.